We just received a new harvest so order now and we ship same day. Quality is excellent. Thai basil has a unique flavor unlike traditional basil. We ship both "Horapa" (sweet basil) and "Krapao" (also known as holy basil or hot basil) varieties. Horapa (Thai Sweet Basil). This variety has thicker stems, is heartier and lasts longer after you received it. It is less expensive than Krapao basil, on a per-pound basis, but much of the weight is in the stems. 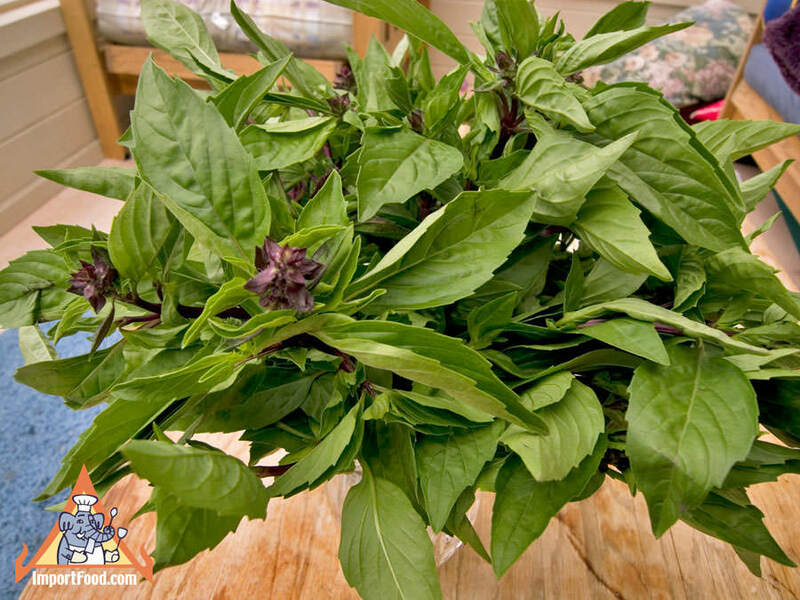 The aroma of sweet basil is strong, has a sweet, peppery flavor slightly reminiscent of star anise, and it comes with hearty stems and often purple flowers. Sweet basil is added to a variety of soups and curry, see links below, as well as a popular garnish to be eaten fresh. Vietnamese cooking uses this abundantly as well. We are pleased to offer a large bunch of fresh Thai basil which will arrive within 2 days after shipment, and we ship at the beginning of every week. The bunch weighs approximately 14 ounces, and has about 24 stalks, each sprig with 25-30 leaves. We also offer holy basil leaves (dried), and instant Thai Basil Seasoning Paste. We ship fresh Thai basil via Priority Mail, quick delivery within 2-3 days straight to your mailbox. They are packaged well and should be refrigerated promptly. Please Note: if you order only fresh produce, select "$0.00" as shipping charge at checkout (because the prices below include shipping). Occasional delays due to Mother Nature & harvest conditions. Call 888-618-8424 if you need a definite delivery date. If you order Thai basil and any other non-fresh items, you must checkout with "Fedex Ground" as the shipping method, and you will receive the other items separately. We also offer a Fresh Thai Produce Kit. Hot peppery "krapao" variety is often added at the very end of a stir-fry, including the recipe below. Many customers over the years have requested krapao but we didn't have a good source until recently. At left is a bundle of 1.5 oz, but what we ship to you is 6 oz. Krapao is delicate with light weight stems and feathery leaves, so 6 oz of krapao is a really big handful. This is grown in Hawaii and is shipped within 24 hours of harvest, but it's very delicate so you should plan to use it promptly. We ship all Fresh Thai Produce via Priority Mail, quick delivery within 2-3 days straight to your mailbox. If you order ONLY fresh basil, select "$0.00" as shipping charge at checkout (because the prices below include shipping). If you also order non-fresh items, please checkout with "Fedex Ground" as the shipping method. Any questions please feel free to call toll free 888-618-THAI. Green Chicken Curry, "Gaeng Khiao Wan Gai" Stir-Fried Fish in Red Curry, "Pad Ped Pla"
Thai Curried Squid, "Plamuk Patpet" Chicken Stir-Fried With Green Curry, "Gai Pad Khiaowan"
Penang Chicken Curry, "Penang Gai" Thai Prawn And Pineapple Curry, "Kaeng Khua Saparot"
Thai Fried Clams in Roasted Chile Paste, Hoy Lai Ped Deep Fried Fish With Garlic Sauce, "Pla Kapong Keemao"
Thai Style Wide Noodles In Thick Sauce, "Kuaytiao Radna" Red Chicken Curry, "Gaeng Phed Gai"
Thai Vegetable Curry, "Kaeng Phak" Drunkard's Noodles and Chicken with Tofu, "Gai Pad Kee Mao"
Thai Fish In Chili, "Pla Rad Prik" Thai Spicy Catfish, "Pad Ped Pladuk"
"You guys really stepped up to the plate. Everything arrived just as I needed it and the product looked great. I teach a cooking class and everyone was asking me where I bought the great Fresh Thai Basil. I hope I can throw some more business your way. Thanks again for getting what I needed to me on time." "I steamed some little neck clams with fresh basil and tom yum paste...what a powerful flavor! I then used the resulting broth on rice noodles and threw in some other seafood. I feel like there are no limits to what can be done with your ingredients -- I have an entire Thai pantry now! I am always happy to let folks know when I am pleased with products, especially when they are accompanied by terrific customer service...unfortunately the latter is extremely hard to come by these days, so when I find it I am that much more appreciative! Your website has been a culinary godsend...it is so hard to find stuff in Asian grocers sometimes because the labels are not in English...I love that you guys have such great descriptions of your products, they have enabled me to try so many different things! I am a real fan of the Pho paste...I can't image ever trying to make the real thing myself, but this is so darn close, especially if you through some star anise in while it is simmering...I have bought it for friends who are huge, but finicky Pho fans and they too have been pretty impressed." Fresh Thai sweet basil will hold up well in the fridge for at least a week, but you might try keeping it at room temperature in a pot of water for longer storage, as long as it arrives in excellent condtion and looks vibrant. Place your fresh Thai basil in a jar of water, then set on the countertop not too far from a window for indirect light. Freezing the basil is not nearly as good as keeping it fresh in water. The Thai basil you see at left has been that way for 3 weeks and still looks like it was just harvested. Simply remove leaves as you need, and save the rest for later. A good batch of Thai basil will keep this way for 6 weeks or longer. Note: we received this email from a customer in January 2009: "I recently ordered some Thai ingredients, including some fresh basil. Following your suggestion, I placed some in a jar of water on the counter. Within a couple of days all of the basil in the jar had wilted. I had placed some in the plastic and damp towel (as it is shipped) and put in the fridge. This looks like it is still fresh. Just thought I'd pass along these results. Also, this email was received from a customer in November 2011: I tried putting my fresh Thai basil in a vase on a sunny window sill and it worked great.....My basil lasted about 2 months......I was very happy." Anyone who has ordered our Fresh Thai Sweet basil is familiar with the wonderful fragrance of our product. Our Hawaiian-grown fresh basil is usually shipped less than 24 hours after harvest..
You might not know that fresh Thai basil keeps fresh for weeks in a vase with water, just put it on your windowsill, pick the leaves you want to cook with, and it continues to grow. Thai basil is known for a the wonderful fragrance and lovely sweet flavor. There are sometimes purple flowers starting to form.